Ben Mackey scored a late winner as Racing Club Warwick edged past hosts Chelmsley Town. 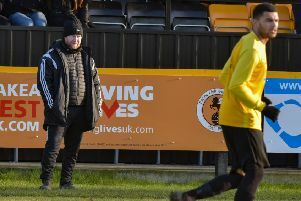 Mackey guided a header home in the 92nd minute to lift Racing Club back up to second on goal difference ahead of Atherstone and Easterlow is hoping the three points give his side fresh impetus going into the final six games of the campaign. “To be honest the performance reflected the bad form we have been in,” he admitted. “It wasn’t the highlight of the season but the fact we kept going right to the death was very pleasing and I was pleased for the lads. “It’s been a difficult few weeks and when you lose games your confidence is knocked and I felt we were too uptight in the second half, perhaps not having the composure you need. “We created some good chances as did they. “All that being said, it’s a cliche but that’s the best way to win any game. “Hopefully that win will give us the confidence to finish the season strong and see where it takes us. Racing Club were again without several key players and the bench was filled with Acedemy player Madundo Semahimbo and two new signings from Coventry United, Shay Nicholson and Matteo Ninna. The game started slowly with both sides unable to force much in the final third and the first half was devoid of real chances. A Town free-kick from 25 yards went just over, while at the other end, Trea Bertie forced the Town keeper into a good save five minutes before the break. The second half followed a similar pattern, with Town looking the more threatening. Henry Leaver cleared a shot off the line and a few last-ditch tackles prevented half-chances from testing Charlie Bannister. However, the Racing stopper was called upon to make a fine save, pushing a long-range effort on to the bar and over. Luke Cole and George Curry were forced off with knocks and were replaced by Nicholson and Semahimbo who twice got in behind the right-back and produced crosses that just evaded Mackey and Bertie. It looked as though more points were going to be dropped before Semahimbo forced a corner well into injury time. Leaver crossed and Castleton rose well to head the ball back across for Mackey to guide it into the top corner to the relief of the travelling contingent. Racing Club host Studley on Saturday.